Tuesday May 7 1907 I had a very busy forenoon with baking and churning I feel wretched with a cold. Mary Woolf was here in the afternoon. And Mollie came out to stay all night we were over to Mrs. [Kovers?] in the evening. Will 59 today. Will put in ice for the first time today. Wednesday May 8 1907 I was busy with the work all forenoon. I did not feel like going down home. Hattie went to Des Moines yesterday to be gone a week. I went down to Frankie [Pointoins?] in the afternoon for while Ralph is working away at the barn painting and Will planted some corn today. 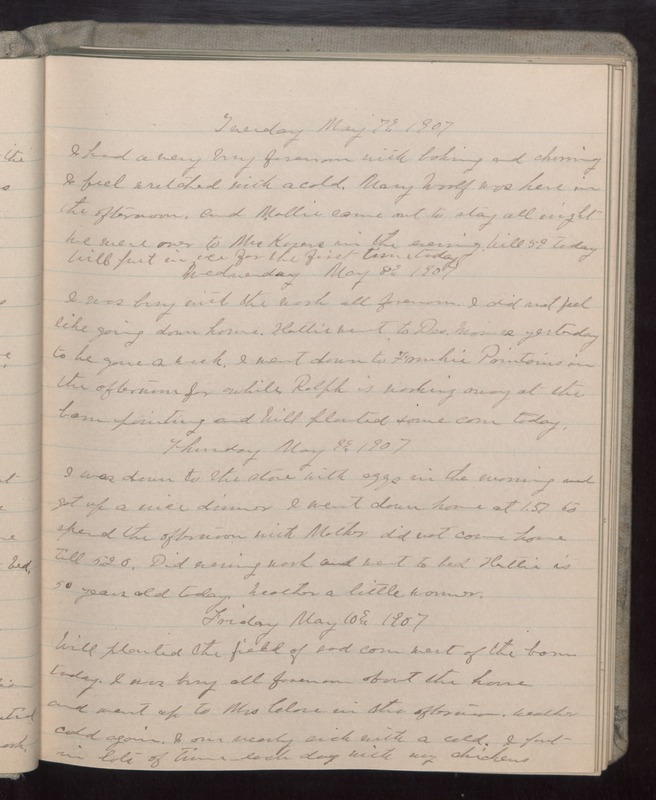 Thursday May 9 1907 I was down to the store with eggs in the morning and got up a nice dinner I went down home at 1.57 to spend the afternoon with Mother did not come home till 5.20. Did evening work and went to bed Hattie is 50 years old today. Weather a little warmer. Friday May 10 1907 Will planted the field of sad corn west of the bard today. I was busy all forenoon about the house and went up to Mrs [Close?] in the afternoon. Weather cold again. I am nearly sick with a cold. I put in lots of time each day with my chickens.